I am a single father and took my only son on the J -Rig Six Day Grand Canyon trip. It was simply amazing and one of the BEST weeks we have ever had together. 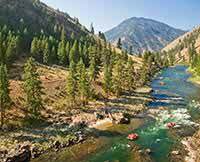 I originally signed up for a trip with Western River Expeditions for the Middle Fork of the Salmon River in Idaho as the Grand Canyon Trip was all filled up. Two weeks before my trip I recieved a call that there was a two spot opening on the Grand Canyon and switched my adventure, what a treat I was in for. Sean M. Blasius – San Diego, Ca.